Dr. Horacio Antonio Cabo is Head of Dermatology Section. Insituto de Investigaciones Médicas “A. Lanari”. University of Buenos Aires, Argentina .He is Ex President of the Sociedad Argentina de Dermatología. 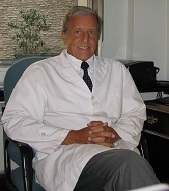 Buenos Aires, Argentina, Member of the American Academy of Dermatology,Member of European Acadeny of Dermatology and Venereology,Treasurer of the Colegio Ibero Latinoamericano de Dermatología, Board Member of the International Dermoscopy Society and South America representative.He has published many articles and books.